Mercedes’ triumph in the Singapore Grand Prix owed a lot to Lewis Hamilton’s ‘stardust’ driving, but one hidden change on his car that we can reveal may have been key to helping him pull off his brilliant weekend. While rival Ferrari had a quick car at times, it was clear that tyre management - one of Mercedes’ weaknesses in the past - had turned to a strength around the Marina Bay circuit. Analysis of qualifying laps showed that Mercedes was better able than Ferrari to prevent its tyres overheating in the final sector - so it gained crucial time there. In the race too, Hamilton was able to keep his tyres alive longer than Sebastian Vettel would have liked in the first stint, and then pulled clear in the second. 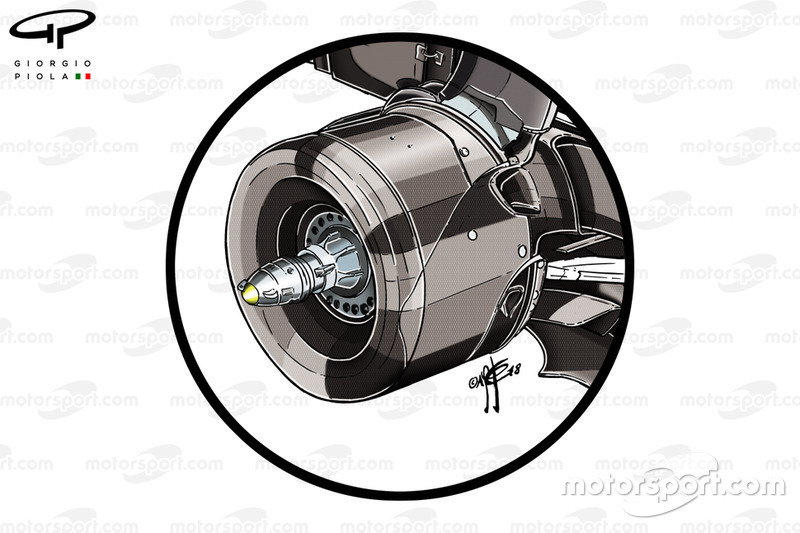 The step forward from Mercedes in extracting more from its tyres - especially the rears - was almost certainly helped by a new rear wheel drum design the team used for the first time. 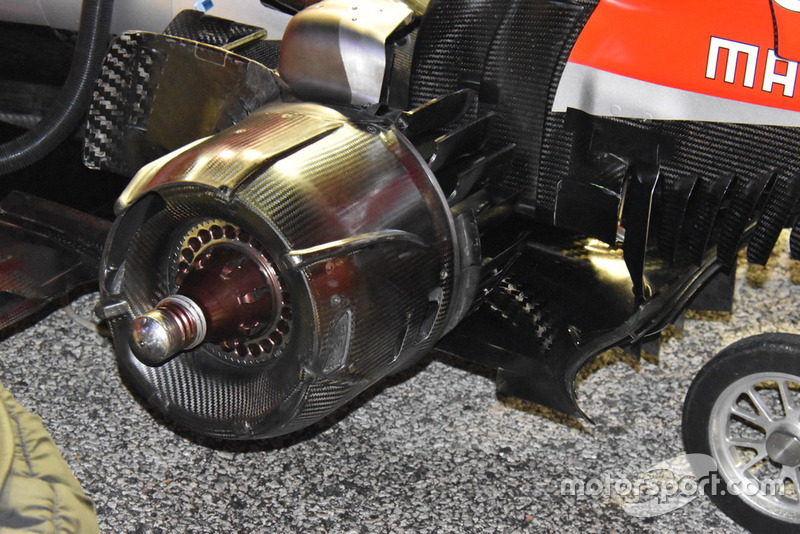 It was not until the cars were laid bare on the grid that an innovative design of new wheel drum was first spotted, as this exclusive image from Giorgio Piola shows. 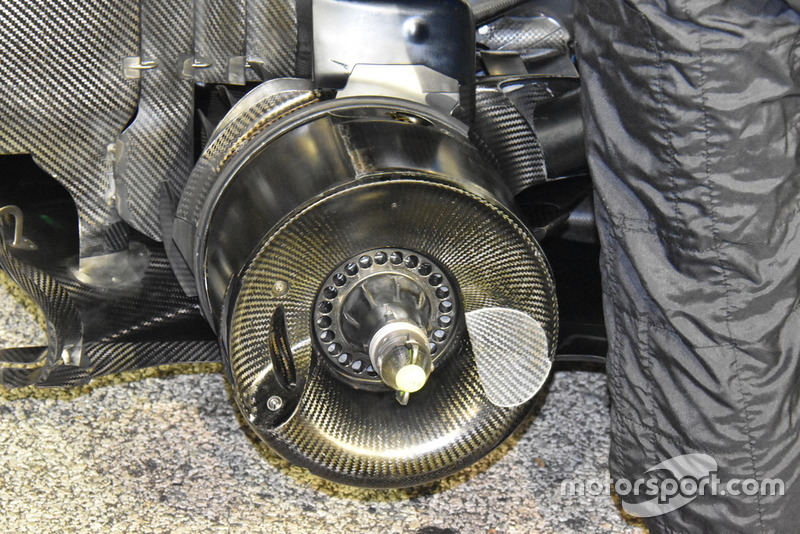 The new carbon fibre wheel drums (seen above) have different cooling ducts and more importantly a unique deep concave shape – which is very different to what it has run before (see below). The old Mercedes version is very similar to what other teams runs, including Ferrari (see below). The concave shape helps create a small air chamber within the wall of the rim, so when it is rotating at speed it is possible to extract more heat from the tyre - and therefore prevent overheating. This new concave idea almost certainly has been designed to work with the radical new rims that Mercedes used for the first time at the Belgian Grand. The intent of the ribbed ‘teeth’ is to help increase the surface area of the rim, so there is greater cooling efficiency. What impact did the changes have? The change to the wheel hub concept would have been enough to change the thermal characteristics of how its rubber behave: and transform the W09’s pace at a venue where drivers struggled to stop overheating the tyres. Indeed, ahead of the weekend, Mercedes engineering chief Aldo Costa had revealed that one of the main focuses for the team in recent weeks was being able to get its rear tyre temperatures under control. It had been noticed several time that Mercedes often removed its rear tyre heaters earlier than the fronts in a bid to help alleviate what was a problem area. Speaking about the car, Costa told Motorsport.com: “We believe that the behaviour in the corners in general is our point of strength, while in the management of the temperature of the rear tyres we are working hard. “We plan to make progress in Singapore where we will have some modifications designed for this and therefore we are making progress with respect to ourselves, but I can not say if it will be enough ". Judging by the performance in Singapore, where, let’s remember, Valtteri Bottas also outqualified Kimi Raikkonen, it certainly appeared to be enough. What else did Mercedes change? 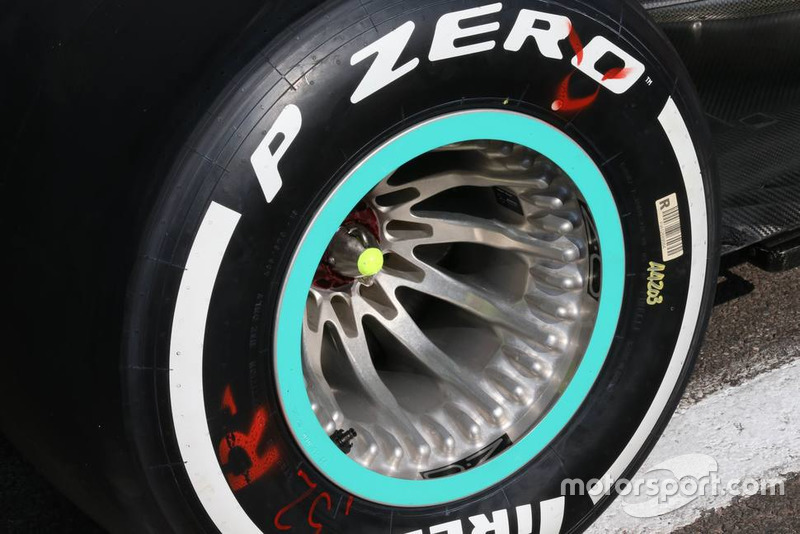 Mercedes did not just focus its efforts on tyre temperatures in Singapore though. Aerodynamically the W09 featured a couple of revisions for Singapore, with optimisations to its high-downforce rear wing design being the most notable. 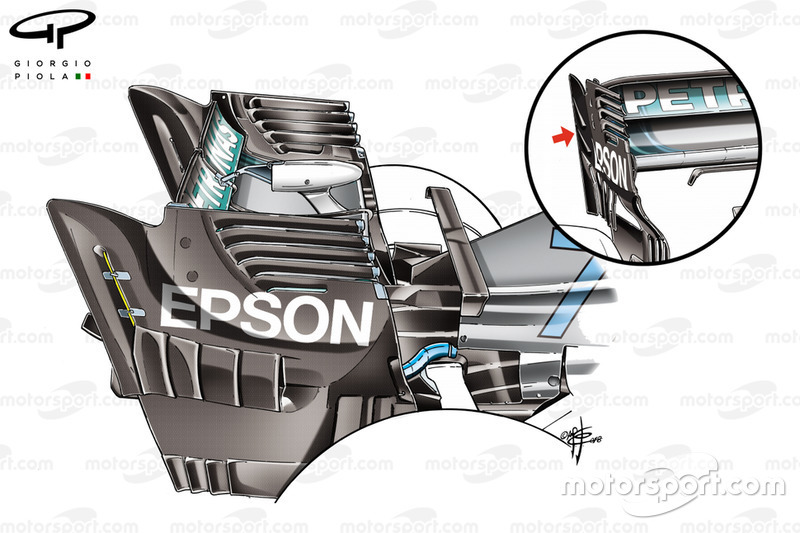 The design, which is heavily influenced by McLaren, utilises a grey area in the regulations surrounding the transition of the wing from one width to another. The FIA has actually set about revising the wording of this article in the regulations for next season, as teams have continued to exploit its intention. Mercedes became the second of four teams to take advantage, when it introduced its interpretation in Austria (inset) and ran the wing again at Hungary. The Singapore variant saw the most rearward slot and displaced strake elongated though (highlighted in yellow), replacing the upwash strikes (arrowed, inset) in order that they work the wing even harder.